Peri-menopause is 2 – 3 years before menopause. If these symptoms happen for more than 8-10 years, the woman have to work on adrenals and feed the liver. What do doctors normally suggest? Hormone replacement therapies. This dramatically increase the risk of breast and uterine cancers. Body frequently can’t handle dosage levels, leading to overdose. Detoxing from bio-identical hormones can take years. Uterine ablation – burning the inside of the uterus. A menstrual cycle is the body’s way of eliminating Estrogen naturally, even if it’s difficult or heavy. If menstruation is eliminated before the body is ready, ESTROGEN DOMINANCE becomes worse! And it leaves a scar. Hysterectomy – 95% of hysterectomies are elective. Short-term complications include IBS, incontinence, and injury to spinal nerves. Long-term complications: continued Estrogen dominance, severe mood changes, vaginal wall fails, loss of libido, weight gain, up to 65% increased risk of additional surgery due to intestinal obstruction caused by scar tissue. MENOPAUSE is 12 consecutive months without cycles. Ovarian production of estrogen and progesterone diminishes completely. Pituitary hormones increase for the first 2-3 years to obtain as much hormone production from the ovaries as possible. Because body turns to adrenals to compensate for lost ovarian hormones, we know the adrenals are exhausted if a woman has any of these symptoms: hot and cold flashes, night sweats, loss of a libido, vaginal dryness, mood swings, weight gain, fatigue, thinning hair, sleep disorders, mental confusion, depression, irritability. HRT presented as the only possible solution, which increases cancer risk in the long term. 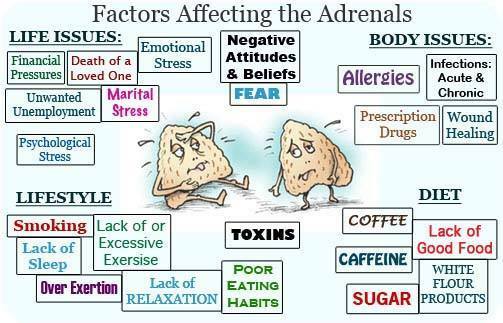 Adrenal support is a must. Get out and move. Choose activities you like, such as yoga, swimming, jogging, etc. – A blend of 3 drops clove (hot oil), 4 drops nutmeg, 6 drops rosemary blended with 1 tsp V6 and then applied to the kidney region (with a hot compress) or vita flex kidney points; may be supportive too.